Professionally Manufacture and Supply Conveyor screen printer,Flat vacuum loading unloading screen printer,Automatic conveyor loading unloading screen printing machine equipment manufacturers etc. The Conveyor screen printer,Flat vacuum loading unloading screen printer, Automatic conveyor loading unloading screen printing machine equipment manufacturers is suitable for printing flat items which size is within 700x1200mm,such as glass board,circuit board,paper board,PVC sheet,plastic film,textile,fabric,keyboard,CD disk,plastic box ,ruler etc. Built with Panasonic PLC and touch screen controlling system. 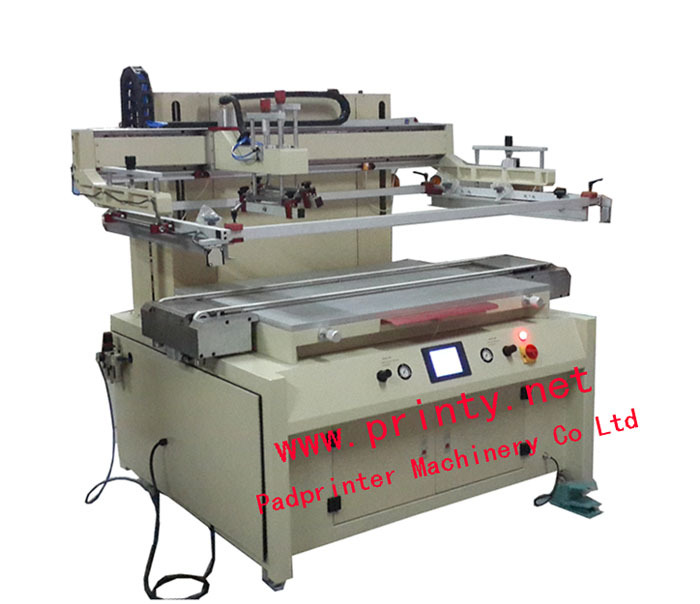 Built with vertical construction an imported linear guiding rails, the screen frame up and down and printing head right and left are driven by transducer and motors. Three printing modes - Manual, Semi-automatic and fully automatic. Built with stainless steel vacuum screen printing table for good quality screen printing result and low noise. Brand-name pneumatic parts are used,precise shafts and bearings are placed in active parts of the machine to ensure smooth and stable runs.